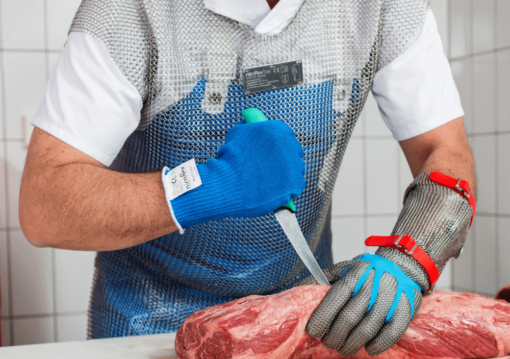 Friedrich Münch GmbH & Co. KG from Mühlacker, Germany, is the leading producer for personal protection clothing and equipment made of stainless steel wire. To ensure the cut and stab resistance of the ring mesh is reliable, the stainless steel wire must be consistently easy to work and perform to spec. To deliver an optimum product, Friedrich Münch relies on the knowledge of Sprint Metal Edelstahlziehereien, a company of Ugitech, which is a Business Unit of the SCHMOLZ + BICKENBACH Group. Sprint Metal works closely with its affiliate Deutsche Edelstahlwerke to provide customers with the materials they need. The focus of the company Friedrich Münch has always been personal safety in keeping with their motto: “Every wire ring can save a life”. Founded in 1920 in Mühlacker, Germany, the company now plays a leading role in the market for industrial safety clothing equipment worldwide. Their specialty is protective clothing made of chainmail, made of stainless steel wire. The main task of the wire ring mesh is to protect the body from direct contact with sharp objects, such as knives, scissors or shards of glass. 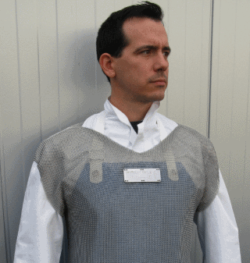 Users include the foods sector, industry and manufacturers of personal protection equipment (PPE) for police, military and security applications. Depending on the type of protective clothing, the wire mesh must meet different standards of geometry and performance in regard to puncture and cut resistance. Another attribute high on the list of priorities: consistently high quality. “Our chainmail must provide the same uniform level of protection at every point,” emphasizes Armin Fehr, Managing Director at Friedrich Münch. “The fine stainless steel wire is our most important quality asset. For over 15 years, we have confidently relied on Sprint Metal products.” Sprint Metal has more than 80 years of experience in the manufacture of high-quality fine and ultra fine wire and always monitors quality to meet the requirements of processing and the final application. By working closely with the steel mills of the SCHMOLZ + BICKENBACH Group, Sprint Metal, as Germany’s only fine wire producer, meets the special requirements of their customers in regard to material modifications, tonnage and dimensions. The mechanical properties and technical quality of the stainless steel wire are the result of the close cooperation between Sprint Metal and Deutsche Edelstahlwerke. The smelt-works produce the starting material according to customer specification: the stainless and acid-resistant Duplex steel Acidur 4462. It combines the ideal mechanical properties of ferritic and austenitic steel grades: high strength and tensile yield strength as well as outstanding corrosion resistance, the prerequisites required to meet standards of hygiene and load in use. Its properties also include good cold formability, allowing Friedrich Münch to shape the wire to spec. The stainless steel can also be optimally welded to form the wire rings without sacrificing strength or forming coarse grains due to the welding temperature – phenomena that would compromise stab protection. To guarantee delivery of the material on time and in the desired quality, all working steps along the value chain are coordinated: from the smelt-works to wire production to further processing as wire mesh. The planning horizon is three to four months. Specific temperatures are maintained during steel production, at the rolling mill and in wire production to obtain the properties the customer requires in the material. This is why Deutsche Edelstahlwerke and Sprint Metal need to plan the corresponding capacities in production carefully. At the Siegen plant, Deutsche Edelstahlwerke melts the stainless steel using single-grade scrap in the 130t electric arc furnace. The alloys are added in the ladle furnace. Finally, the melt undergoes vacuum degassing, and the chemical composition is precisely adjusted. This procedure is much more rigorous than the standard analysis and takes into account optimum corrosion resistance and cold formability. This lays the foundation for the optimum steel properties throughout the life of the product. 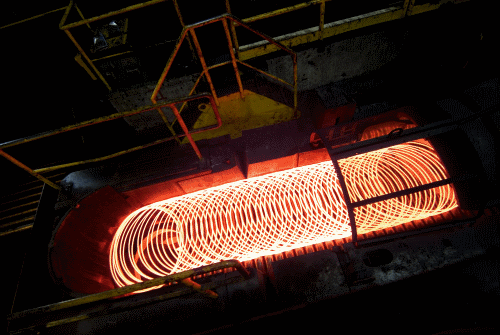 Solidification of the melt takes place in the circular arc continuous casting plant. The billets produced are fine-polished to the desired surface roughness. 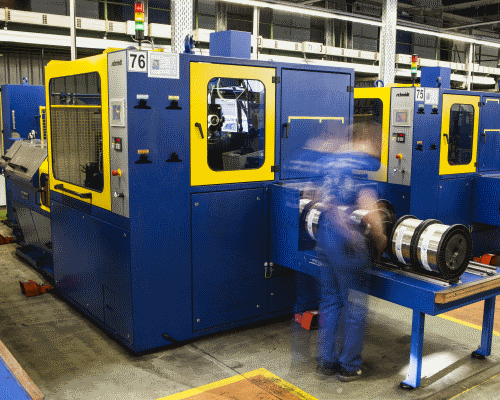 Deutsche Edelstahlwerke then goes on to produce a wire with a faultless rolled wire surface: the Hagen rolling mill rolls the wire starting with 138 mm square billets and produces a wire with a diameter of 5.5 mm. In a sophisticated pickling process, the rolled wire is freed from scale and inspected. The wire is then drawn to a diameter of 1.6 mm round. The wire is then put through bright annealing in a protective gas atmosphere to ensure it is easily formable at Sprint Metal to thinner cross sections while retaining its bright surface. “The partnership and cooperation with Deutsche Edelstahlwerke is a true added value and the prerequisite to providing our customers with a high-grade wire product,” says Mimmo Marsiglia, Product Manager Fine Wire at Spring Metal. Following positive quality inspection of the wire spool, the wire goes through up to 38 forming stages to achieve the desired quality and dimensions. To reduce the cross section of the stainless steel wire to the required final dimensions of 0.50 to 1.10 mm, drawing dies are used which Sprint Metal polishes in the company’s own drawing-die polishing unit to internal specifications. This combats signs of wear and guarantees the required drawing die geometry is ensured. This has a direct impact on wire quality. Sprint Metal uses a wet-drawing process on the material. 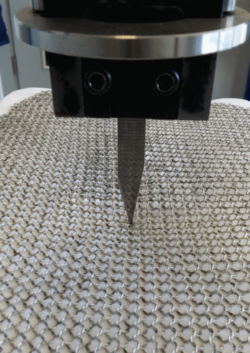 The immediate plastic deformation changes the microstructure and improves strength – an attribute relevant to the stab and cut resistance of protective clothing. While the wire is rolled up, Sprint Metal coats the surface to wind up the wire into uniform coils. To adjust the desired forming properties for further processing by Friedrich Münch, the wire manufacturer anneals the wound coils in a protective gas atmosphere until soft. The subsequent quality inspection is the seal of approval for delivery to Friedrich Münch. Washing, cutting, forming, welding, polishing – the material undergoes numerous processing steps at Friedrich Münch as it progresses from stainless steel wire to the homogenous mesh. To ensure that every ring is identical, the diameter tolerance of the stainless steel wire on all spools is ± 0.01 mm. This is the main prerequisite for reliable processing and precise manufacture as well as consistently good cut and stab resistance. Another factor is the uniform winding and surface quality of the wire to ensure that the material is introduced into the processing machines smoothly. After winding off the wire, Friedrich Münch cuts the wire to size and bends it into rings, welds the ends and polishes them to a high gloss. The rings are then made into a 1:4 chainmail mesh and cut in cutting machines to pattern size. Millions of rings pass through the company’s machines. Deutsche Edelstahlwerke is with around 4,000 employees one of the world’s leading producers and processors of special steel long products. The company offers international customers a uniquely wide range of product dimensions, from drawn wire with a diameter of 0.8 mm to open-die forgings with a diameter of 1,100 mm. As a technical competence partner, Deutsche Edelstahlwerke develops innovative, individual special steel solutions for complex high-tech applications, and offers services ranging from steelmaking to in-depth steel processing and steel finishing. 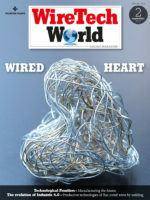 Sprint Metal Edelstahlziehereien GmbH is one of the world’s leading manufacturers of drawn stainless wires. The company was established in 1981 after the acquisition by the French firm Sprint Metal S.A. (presently: Ugitech S.A.). Sprint Metal has over 80 years of experience in producing hightech stainless steel products. The product range covers wet drawn wire in sizes from 0.013 mm to 1,4 mm. Sprint Metal offers a wide product portfolio of grades in annealed and hard-drawn condition with custom made mechanical properties, coatings and spool types. Ugitech is one of the leading manufacturers of stainless steel long products worldwide. Main products include billets, bar stock, wire rod, and drawn wire that the company produces in their own mills and plants. The stainless steels are known for their excellent mechanical properties. They are used to manufacture a wide range of parts, such as e.g. valves, turbine components, welding wire or surgical instruments. With over 100 years of experience, Ugitech guarantees optimum steel solutions for demanding applications for its customers.